We are finally in the prime of the summer. The rain of May has dwindled into flowers and beach weather in June. Vacations have begun and the fourth of July is around the corner. The view is a little different than usual on my end this summer. Instead of waking up slowly and working late into the night as a waitress, I am waking up with the rest of the commuters and hitting the hay shortly after the sun sets. The yellow that surrounds me is not that of the rays of the sunshine, but the light yellow-tan color of the walls of an office building and the blue of the clear sky has been replaced by the blue background of the desktop that I work on seven hours out of the day. This summer I am working at a private wealth management firm in Marlborough, Ferris Capital. 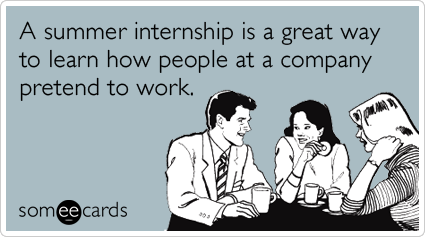 My job, along with five other interns, is to help the firm with business development. I am to learn the ins and outs of the company in order to learn Ferris Capital’s specific mission and value-add and to broaden my knowledge of the finance industry, and to reach out to prospective clients. Here, I plan to write roughly once a week about my experiences during the internship. I am posting the first three a little late, so bare with me on the order of the posts. Feel free to reach out throughout the summer by commenting on the post via Facebook or emailing me at Thalia_Chodat@student.uml.edu with questions about resumes, internship/co-op searches, interviews, internship attire, time management, etc.